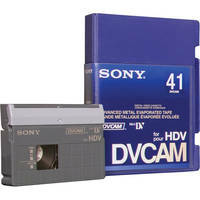 Sony's DVCAM for HDV Tape was redesigned by their hardware and media engineers, to enhance recording media. This provides a highly durable DVCAM format videotape specifically designed for professional HDV recording. Targeted specifically toward everyday HD video applications and ideal for dailies, stringer projects or postproduction, the DVCAM for HDV tape offers extremely low error and drop-out rates, high durability and superb image quality. Offering the same tolerance and dependability of DVCAM tape, the DVCAM for HDV tape is the reliable media option for HD tape-based productions - at the same price point as DVCAM, giving shooters an affordable, high quality option for everyday HDV recording, while continuing to satisfy the defacto standard of DVCAM recording.